Having previously shared the view of the whole buildings at Syracuse University, I thought I would show you some details from each today. Colorful Boston Ivy on the Hall of Languages. The ivy was about the only colorful living thing around the campus with lots of small blue berries still on the vines. On the sun ward side of the building, all the leaves and most of the berries had already dropped leaving a web like presence clinging to the limestone exterior. 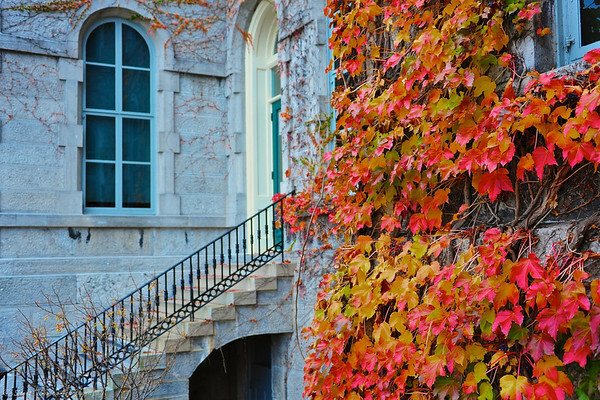 Autumn ivy vines clinging to the Hall of Languages on the Syracuse University campus in Syracuse, New York. Nikon D700/28-300VR, 1/60s, f/4, ISO 450, EV 0, 38mm focal length. The Newhouse Communications Center III features the “Liberty Wrap” with the words of the First Amendment from the United States Constitution etched in six-foot high letters on the glass surrounding the building. 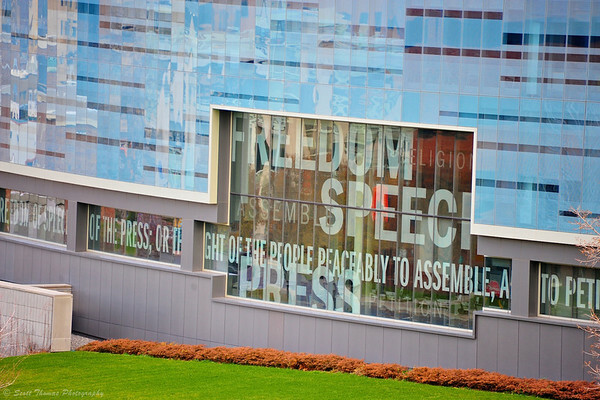 "Liberty Wrap" features the words of the First Amendment etched in six-foot high letters on the glass wrapping the Newhouse Communications Center III building on the Syracuse University campus in Syracuse, New York. Nikon D700/28-300VR, 1/125s, f/5.6, ISO 900, EV +0.3, 300mm focal length. Bowne Hall has some interesting window treatments. I could not find out why they used what looks like copper for the window frames back in 1906. This is the most protected part of the building which gets little sunlight because of a big hill right behind me. The metal is the cleanest here. The metal on the other sides are more tarnished. Metal windows on the Bowne Hall Chemistry building on the Syracuse University campus in Syracuse, New York. Nikon D700/28-300VR, 1/125s, f/5, ISO 200, EV 0, 28mm focal length. Remember, when photographing large objects, do not forget to get in close for the neat little details which make each unique. 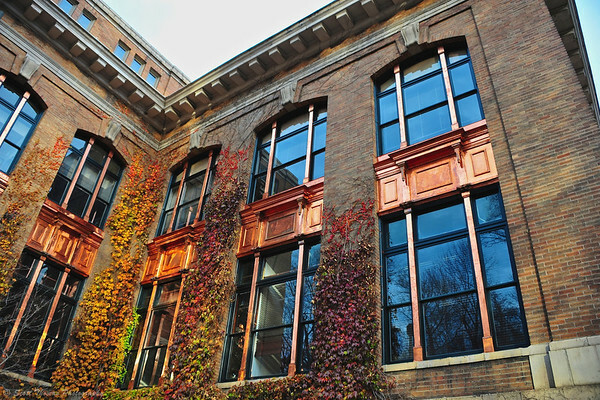 This entry was posted in Photography and tagged 28-300mm, architecture, autumn, buildings, color, copper, details, glass, ivy, limestone, metal, new york, nikon D700, reflection, syracuse university, vines, vr, windows. Bookmark the permalink. I’m a detail fanatic, and am usually zooming in on details, sometimes I even forget to zoom out and take photos of the “bigger picture” LOL. It’s good to get the overall photo for comparison. I am one that forgets to get in close for detail so this was a good lesson for me. Something I need to do more of. The ivy looks so pretty, and I love those metal windows! Everyone loved the ivy. There are many photos on the Meetup sight of them. I like those metal windows too. Would hate to have to keep them clean! The second one. I really liked the composition on this one. Interesting how you can see the “right of the people to peaceful assemble” in that photo with all the Occupy protests being challenged. Loving the details you’ve pointed out. And the colors in these photos! Kind of makes you want to go back to college, doesn’t it? Great photos – and message: I’m trying to capture the details from larger motives more often too. Love those architectural details, Scott. The last picture is special with its various shades, patterns and reflections. Maybe wooden frames were replaced with copper ones that would last longer ? You see this quite a lot over here.